There is a fun chart out there that shows how women view color differently than men. Men see blue, green, orange and women see sky blue, pistachio green, burnt orange. While this is just a stereo type, people do view colors in these two ways. Being descriptive when talking color is not second nature but if practiced, it will save you unnecessary back and forth between your vendors, clients, or co-workers. 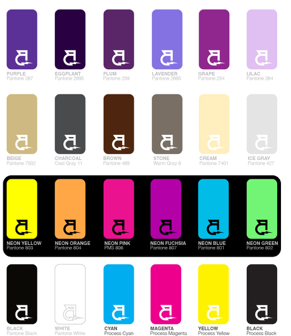 The best way to decide on design colors is by using The Pantone Matching System(PMS). The Solid Coated Guide is what works best with apparel printing. If you hired a firm to design your logo, they should have given you this number. Remember, all monitors are different. If you want your t-shirt print to match the design you see on your computer screen, then call out Pantone Colors for each design color. We buy our books directly from PANTONE'S WEBSTORE. If this is out of your budget, then feel free to download our stock colors which represent the most popular color shades for each each color category.